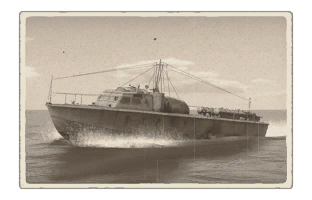 The Higgins 81 ft PT-6 is a reserve rank I American motor torpedo boat with a battle rating of 1.0 (AB/RB/SB). 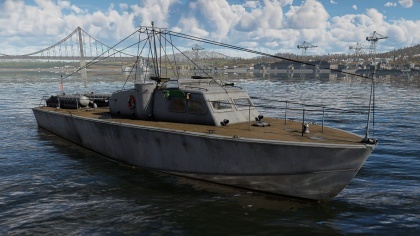 It was introduced in Update 1.79 "Project X" as part of the fleet closed beta test. The PT-6 is the first vehicle of the American naval collection. It is a basic torpedo boat that can hold its own against other reserve rank boats but lacks the firepower to engage heavy targets. Talk about the vehicle's armour. Note the most well-defended and most vulnerable zones, e.g. the ammo magazine. Evaluate the composition of components and assemblies responsible for movement and manoeuvrability. Evaluate the survivability of the primary and secondary armament separately. Don't forget to mention the size of the crew, which plays an important role in fleet mechanics. Tips for preserving survivability should be saved for the "Use in battle" section. If necessary, use a graphic template to show the most well-protected or most vulnerable points in the armour. Write about the ship’s mobility. Evaluate its power and manoeuvrability, rudder rerouting speed, stopping speed at full tilt, with its maximum forward speed and reverse speed. The PT-6 has 2 turrets placed on either side of the cockpit with one M2 Browning each. Many ships are armed with torpedo launchers, and for some vessels such as boats, torpedoes are an extremely important means of defeating an opponent. Evaluate the position of the torpedo launchers, discuss the ammunition available, firing specifics such as dead zones, features of the torpedoes themselves, etc. If there is no torpedo armament, remove this section. Depth charges, mines, rocket launchers and missiles are also effective in skilled hands and can be an unexpected surprise for an opponent. Evaluate the ammunition of this type of armament and rate its performance in combat. Describe the technique of using this ship, the characteristics of her use in a team and tips on strategy. Abstain from writing an entire guide – don’t get try to provide a single point of view, but give the reader food for thought. Talk about the most dangerous opponents for this vehicle and provide recommendations on fighting them. If necessary, note the specifics of playing with this vehicle in various modes (AB, RB, SB). Describe the history of the creation and combat usage of the ship in more detail than in the introduction. If the historical reference turns out to be too big, take it to a separate article, taking a link to an article about the vehicle and adding a block "/ History" (example: https://wiki.warthunder.com/(Vehicle-name)/History) and add a link to it here using the main template. Be sure to reference text and sources by using <ref>, as well as adding them at the end of the article. This page was last edited on 26 March 2019, at 05:18.